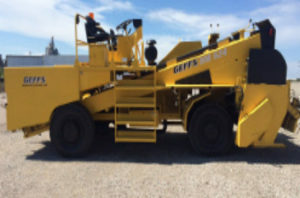 This is a good used Model BM624 chip spreader Manufactured by GEFFS Manufacturing, Inc.
Unit has a Caterpillar 6 cylinder inline diesel engine, Funk longdrop powershift transmission, Axletech front and rear drive axles, 11" x 20" compactor tires, air over hydraulic front brakes, spring brakes rear, spring disc parking brake. 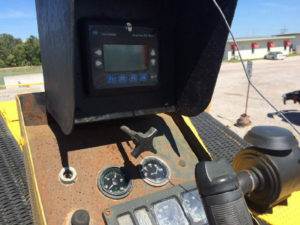 Comes with rate and gate control system (cars2x) for individual gate opening and closing for spread width and rate control which maintains application rate as speed change. PSY (pounds per square yard) can be adjusted on the fly. 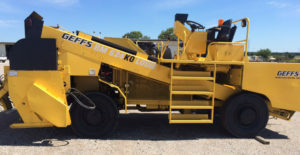 Hopper is a 10-16 foot width with 12 and 9 1/2 inch gates to vary width. Individual gates are controlled via air cylinders from the operator's station. The gates can be closed or opened while chip sealing on the fly. 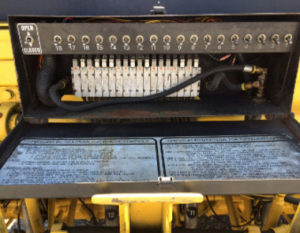 Hitch is activated electrical over hydraulics and is positive locking to truck hitch. 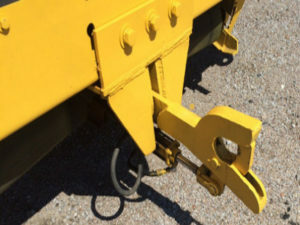 Hitch can be adjusted for truck height from operator's station. Trucks can be hooked and unhooked on the fly. 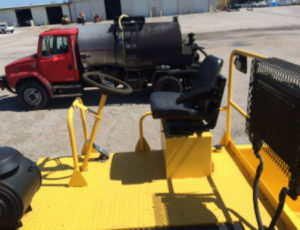 The second man station also has a hitch release switch. 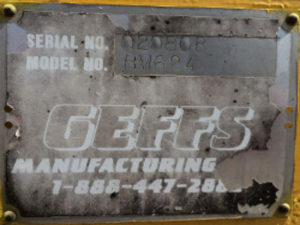 All parts are available through GEFFS Manufacturing, Inc. for repairs when needed. Individual air gates allows changing spread width on the fly. 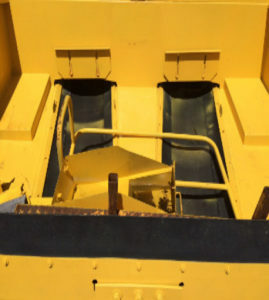 Six yard rear hopper feeds the two twenty-four inch conveyor belts. 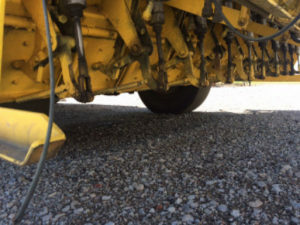 Vertical and horizontal seals reduce aggregate spillage from trucks while hooked.